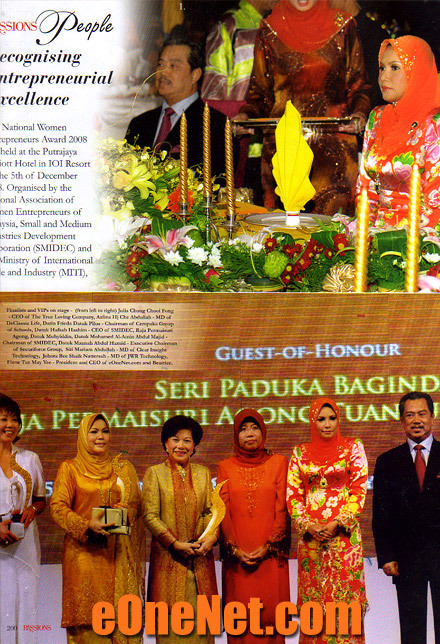 The National Women Entrepreneurs Award 2008 was held at the Putrajaya Mariott Hotel in IOI Resort on the 5th of December 2008. Organised by the National Association of Women Entrepreneurs of Malaysia, Small and Medium industries (SMIDEC) and the Ministry of International Trade and Industry (MITI), the event recognised exemplary women who have shown distinction and excellence in entrepreneurship through their respective field of business. The 10 finalists who were short listed included PASSIONS very own Managing Editor, Ms. Beatrice Nirmala Adaikalaraj. The winner of the Awards was Datin Frieda Datur Pilus, the Chairman of Cempaka Group of Schools. "Recognising Entrepreneurial Excellence - Passions People - Fione Tan"